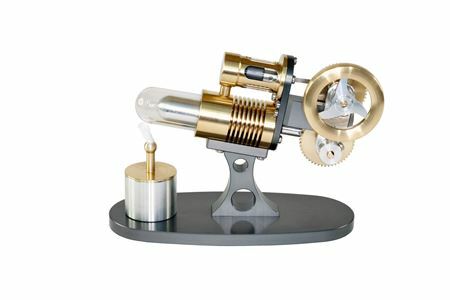 This is our first Stirling engine with gears. 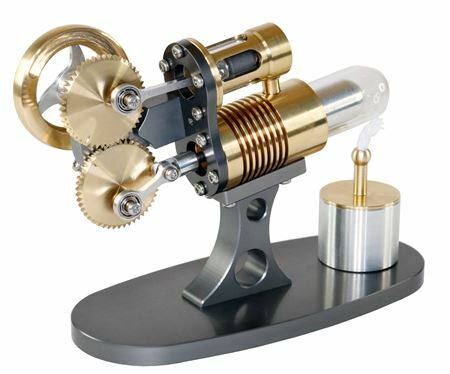 Part of the nano engine family, rather than having a crank or ross yoke arrangement to connect the pistons this engine has gears. Using gears provides some interesting advantages. Firstly it allows the con-rods to remain fairly parallel which in turn reduces friction. The gears also act as a second flywheel smoothing the running of the engine. 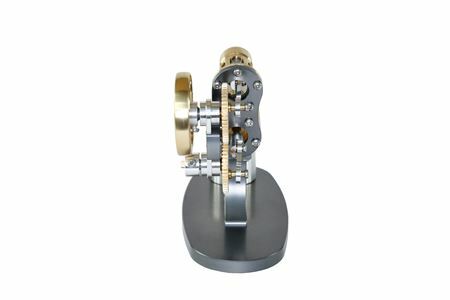 Gamma Stirling engines are naturally unbalanced as they have 2 different sized pistons that are not in phase. Adding two relatively large masses (the gears) as a dead weight has improved the vibration characteristics. Overall this engine is compact, blisteringly fast with an interesting gear arrangement. This beautiful engine will run at over 2000 rpm on a tiny methylated spirit flame.